When many people think about royal weddings, two of them immediately spring to mind: the big royal nuptial bashes held in Britain in the 1980s. 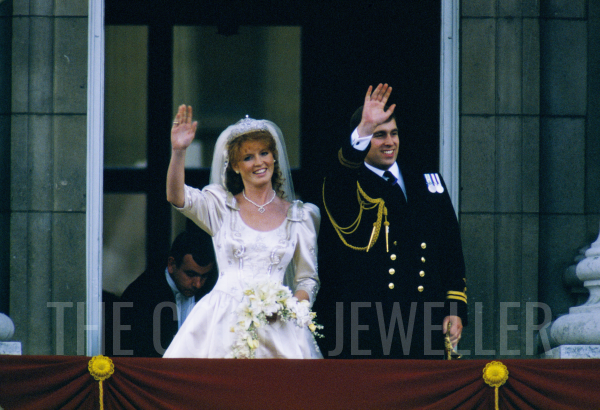 Today, let’s look at the bridal tiara worn to the second of those weddings — the sparkler worn by Sarah, Duchess of York. 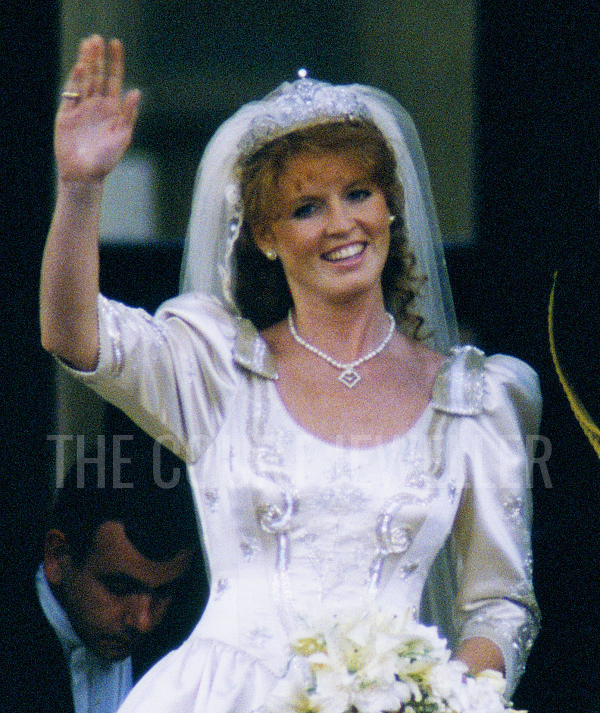 Most will remember that Sarah Ferguson walked up the aisle of Westminster Abbey in 1986 wearing a massive crown of flowers. She had her tiara hidden underneath, but she wanted to emphasize her shift from commoner to member of the royal family, using the tiara to symbolize her new status. 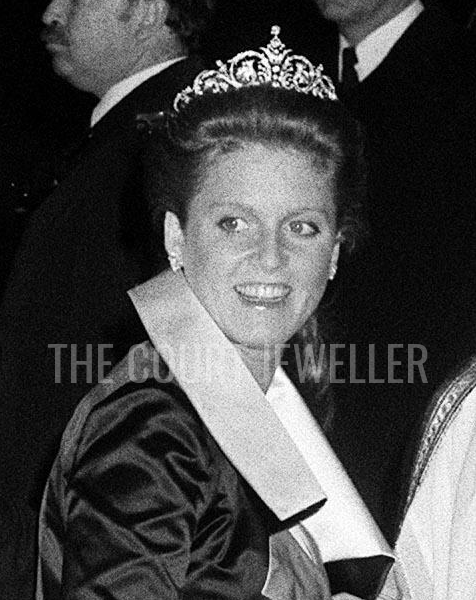 When the new Duke and Duchess of York stepped away from the television cameras to sign the wedding register, the flowers were removed, and the new duchess returned sporting this diamond scroll tiara. Unlike most of the tiaras worn at British royal weddings, this piece was completely new. It was purchased for Sarah by Queen Elizabeth and Prince Philip from Garrard. Some have suggested that Sarah first borrowed the tiara, which was then subsequently purchased for her by the Queen; I don’t believe it’s been firmly made clear exactly what the specific circumstances of the purchase were. The tiara does seem to have been borrowed initially — the palace commented on the day that it had been lent by "a family friend." Or perhaps this was just palace code, and the "friend" was really Liz ‘n Phil? Perhaps we’ll never really know the exact circumstances behind the tiara's acquisition, but regardless, Sarah wore it on the day, and after that, it was hers. We saw her wear the tiara on numerous occasions throughout her marriage, including the March 1987 banquet pictured above. The tiara has remained Sarah’s personal property even after her divorce from Prince Andrew. Post-divorce, she has still found occasions to pop on the sparkler for white-tie events. (Above, she wears at at Elton John's White Tie and Tiara Ball in 2001.) This one hasn’t been brought out of the safe in quite a while, but I think it's possible that we may see it out and about soon: perhaps worn by Princess Eugenie at her wedding to Jack Brooksbank this October.